The topic of fat storage and distribution is intriguing yet often misunderstood. Anyone who knows me also knows my aversion to spot reduction when it comes to losing body fat. And yet, by taking a look at where you are holding the unsightly mass, you can make some adjustments to look better faster. There are three different kinds of body fat: intramuscular, subcutaneous and visceral. Visceral fat is the one that wraps around the organs and creates the beer belly (mostly in males). It is most dangerous to your health (think heart attacks, cancer and diabetes) but also lost the easiest as it is directly connected to the liver. Get on it! Intramuscular fat does not play a huge role for most athletes, except those who train in colder environments such as swimmers. If you fall into that category there isn’t much to be done since your body needs to stay insulated. Subcutaneous body fat (the stuff under the skin) is the kind of fat people wish to lose as it obscures their beautiful muscles and personality. The following deals primarily with subcutaneous fat. Disclaimer: Regardless of where you store your body fat, you will still need a calorie deficit to lose it. Sorry. If most of your body fat sits in the abdominal region, you most likely suffer from elevated cortisol and stress levels (welcome to NYC!). Try to get as much rest as possible; massages and yoga (did I really just say this?) can help. No electronics in the bedroom, ZMA can improve sleep quality greatly. Diet wise stick to frequent high protein meals and use BCAA’s during your workout and upon waking. 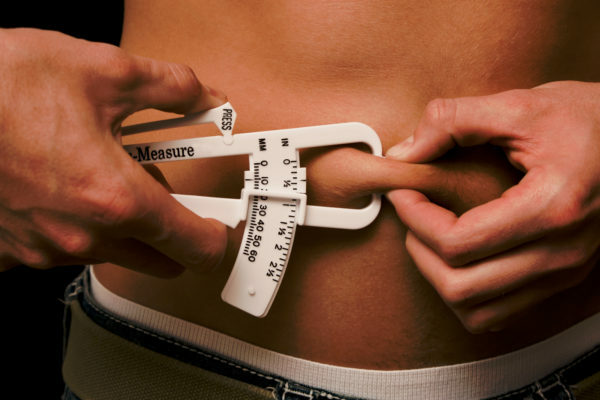 If most of your body fat accumulates in the waist that means your insulin efficiency is poor. Reduce starchy carbs to one meal a day; eat only vegetables and lean protein during the rest of the day. Adding fish oil and r-ala can help, along with weight training to increase your potential for carb storage. If your body fat sits around the shoulder blades this can also be a sign of poor insulin efficiency, see above. If you are accumulating body fat around the chest (as a male), your testosterone levels might be low. Start consuming healthy fatty acids from nuts, egg yolks, avocados, red meat and add resistance training to your routine. If your triceps and thighs are holding body fat (this one is for the girls), your estrogen is too high. Definitely increase your exercise volume along with the consumption of cruciferous vegetables (broccoli has been shown to have some estrogen lowering qualities and it is in season now). While losing body fat always has to be a combination of proper diet, training and recovery; it does pay off to look into the details once the larger pieces are in place. That being said, 80% of your success will be determined by whether you consume fewer calories than you use and the ratio of your macro nutrients; then worry about the smaller stuff such as supplements. Previous post: Does Food Quality Matter? Next post: THE GLUTEN FREE CRAZE – WILL COOLER MINDS PREVAIL?